Hairborist has a wide selection of plant-based hair dyes. With over 18 different luminous shades of natural hair colour to choose from, including 2 colour boosters that intensify hair tones. Our natural hair colour line gives you a more natural route to obtaining long-lasting and vibrant hair colour. Our 100% natural hair colour dyes are infused with pure petals, flower pistils, herbs and plant extracts giving your hair stunning natural-looking results. These 100% natural plant-based hair dyes are non-toxic, hypoallergenic and free from any carcinogenic ingredients such as PPD, Toluenes, Diamines, PEG, aminophenol, resorcinol… Our natural hair colour balances and nourishes each and every hair strand. This results in a more caring and less damaging colour with a healthier dye penetration. 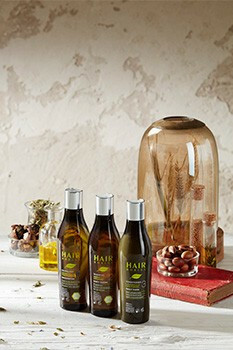 Furthermore, the tannic acid content protects, strengthens and gives hair a glamorous shine. Get uplifting and intense hair color shades, identical to conventional hair dyes. Revive hair color even in darker shades. Perfect coverage for white and grey hair. Natural looking highlights or lowlights for white or grey hair. All products are environmentally friendly . All products are healthy and hypoallergenic. Since the colourants are 100% natural plant-based hair dyes, it will not break-down your natural hair colour pigments, as is the case with traditional chemical-filled dyes. These herbal dyes are free from aggressive agents. Darker hair tints may require a longer application compared to lighter shades. Natural hair colour works differently from oxidative hair dyes. Here are some useful tips to help you understand the natural plant-based hair colour process and how to obtain lasting results. Henna’s beautiful soft coppery colour coats and varnishes hair naturally. The other plant extracts change the hair colour during the first or second application. To obtain a more darker intense hair colour shade, we recommend you wait 48 hours from application to shampoo wash your hair. This allows the oxidation process to continue and strengthen colour to really settle in. A Natural Color product after colouration is advisable. Our conditioner is specially formulated to lock in moisture and straighten out hair after natural hair colouring. It strengthens and protects colour while maintaining an intense shine. Preserve hair colour with the correct hydrating and nourishing hair treatments. Care for your hair between two hair dyes – we recommend using our Renovator Shampoo. Would you like to know more about our 100% natural hair colour? Read more here.